Hey everybody… VOTE (up to 35 times!) for our talented friend, @qparler …http://charlestoncitypaper.secondstreetapp.com/l/Best-of-Charleston-2016-1/Ballot/CultureArtsandEntertainment … Seriously! You KNOW she should win this! No 1 ever accused @qparler of reading well. #newmexicopassport – u must register & can only vote 1 …http://charlestoncitypaper.secondstreetapp.com/l/Best-of-Charleston-2016-1/Ballot/CultureArtsandEntertainment … Please do though! It is always great to see Clay supporting his friend, Quiana. Quiana is an amazing singer and her great personality shines as she performs. Quiana lives in Charleston, South Carolina. She began her professional career singing for Calvin Gilmore of the “The Carolina Opry”. 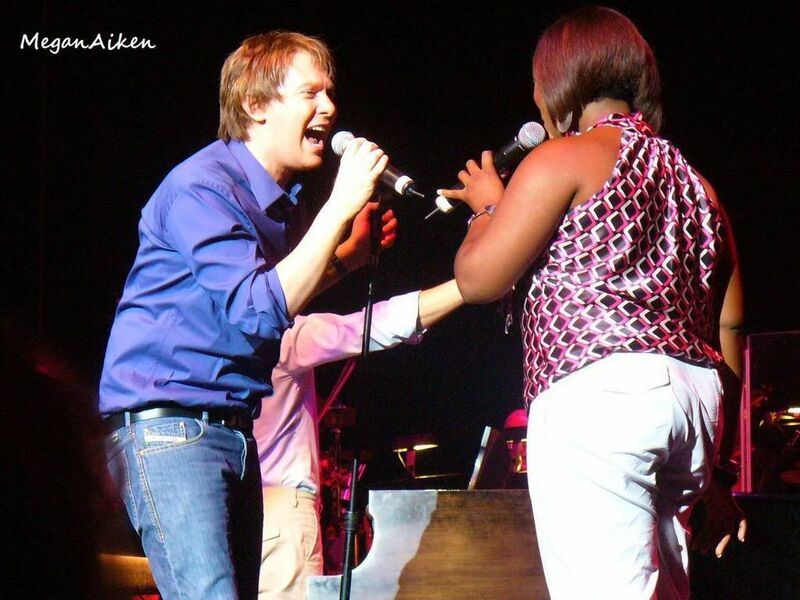 After the second season of American Idol, Quiana began touring as a vocalist with Clay. She became an important part of the concerts for both her musical talent and fun personality. Quiana is back in Charleston and , according to East Coast Entertainment, has put together an incredible group of players and singers to form a musical and popular band. The group has traveled all across the USA and abroad to entertain. So…why not take Clay’s suggestion and VOTE FOR QUIANA!!! It is always fun to look back at some of the tour highlights from Clay and Quiana. Do you remember these performances? On July 23, 2007, Clay and his team put on a wonderful concert in Sterling Heights. Unfortunately, one of Clay’s back-up singers, Angela Fisher was feeling poorly. She was not able to sing her featured song that night. So, Clay and Quiana improvised a duet of the song. This impromptu performance ended up being a highlight of the tour. The next month, the tour made its way to Ft. Myers, Florida. The show was going well, but when it was time for Quiana’s solo, the lighting man just couldn’t get it right. Somehow, he refused to shine the spotlight on anyone but Clay. After many hand signals and hints, Clay finally sat down on Quiana’s stool and she sat in front of him. The performance ended up as a wonderful musical performance by Quiana and some good giggles from Clay. You just have to see this one. The title of the song “When The Lights Go Down” fit the problem completely. I would love to see Quiana perform again! And Clay…can we have some more “Twitter Days”? Those small messages you share bring lots of smiles to lots of people! Error: Error validating access token: Session has expired on Tuesday, 21-Aug-18 16:13:01 PDT. The current time is Thursday, 18-Apr-19 11:44:42 PDT.